Axess2 specialises in designing outstanding glass lifts for both the commercial and domestic market. In recent years’ home elevators have become more popular than ever, with glass lifts specifically designed to meet interior design needs of a residential client. not to mention our glass lifts for the commercial market too. At Axess2, we have become accustomed to focusing on making sure our glass lifts have become safer, more efficient and, most importantly, bring innovation to the market. In addition, the interior design of our glass lifts have become more environmentally friendly to meet current issues such as global warming and making our products more “green”. There are very few other manufacturers who have lifts that offer solutions that not only follow current trends but meet the current needs of the bespoke lift market like we do. One of our most popular and prominent lifts, the Traction 600 (Galileo) which offers solutions for shaft spaces with limited headroom, limited pit space or non-typical dimensions. 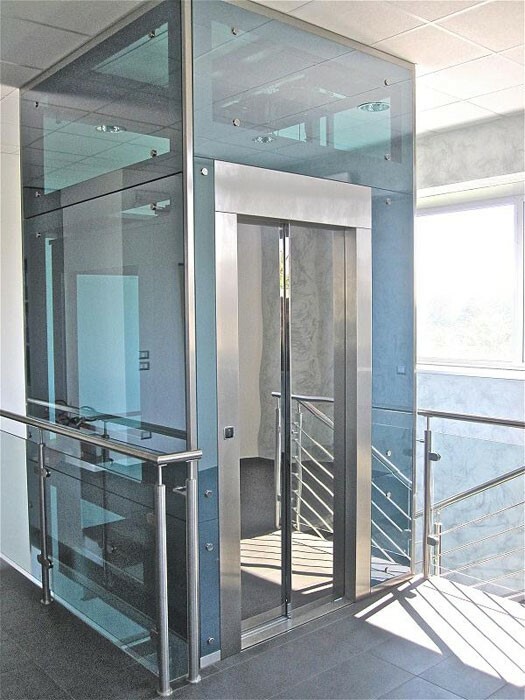 The Traction 600 Galileo lift is built to suit the needs of buildings such as hotels, offices and retail stores that require a highly efficient vertical transport solution. This Galileo lift is an outstanding lift that is very hard wearing and can carry out thousands of trips every year, transporting passengers with proven accuracy, reliability and safety. With the current trend of focusing on developments to help make every aspect of your house or business eco-friendlier, the Galileo passenger lift is a fantastic choice for delivering sufficient savings in energy consumption and, subsequently, costs compared to other passenger lifts. The Galileo lift operates from a UPS system, this makes sure that no passengers are at risk of being trapped in the circumstance of a power outage and no hand winding is needed. The lift has an electrical emergency rescue system from the control panel located within a landing door. Our new technology “LIFTEYE” is implemented in the controller where, in the event of any failure, we can view and diagnose the problem from our HQ, with the possibility of resetting without the need for an engineer. Our Traction 400 Leonardo Lift is the first platform lift with sliding doors, the new Leonardo lift requires only a shallow 200 mm pit and a low bedroom height of 2700 mm. Also this lift is for both public environments and home buildings, it also can have a bespoke car interior to suite various design preferences. The sliding doors feature not only gives a fresh new look to platform lifts but it also means space at the front of the car entrances are not required for the doors to swing open. The Hydraulic 500 Rafael lift has a lot of the benefits of the Leonardo, such as the low headroom height and the 200 mm low pit, but with the added bonus of the higher load capacity. These lifts also don’t require a machine room which saves plenty of space. With the increasing demand for glass lifts, we at Axess2 are always looking out for the latest technological developments; we are well equipped to provide the right glass lift for your design preferences and needs. We have a wide range of glass lifts to meet various needs and preferences, contact us and one of the members of our team will work alongside you to create your ideal lift.